If you think I have poor taste…..you’re right….but so do you. I readily admit it, I’m taste challenged. Just one more item on the long list of things my dog has taught me. I was wondering if my big dog was becoming a fresh water snob. She was suddenly turning down water only a couple of hours old and insisting I give her fresh water from the little dog’s bowl instead. It was puzzling to say the least. When we got a second dog several months ago, we naturally got all the paraphernalia that goes with a puppy. And since she was of the lap dog variety, everything was scaled way down from our Labrador Retriever’s stuff. 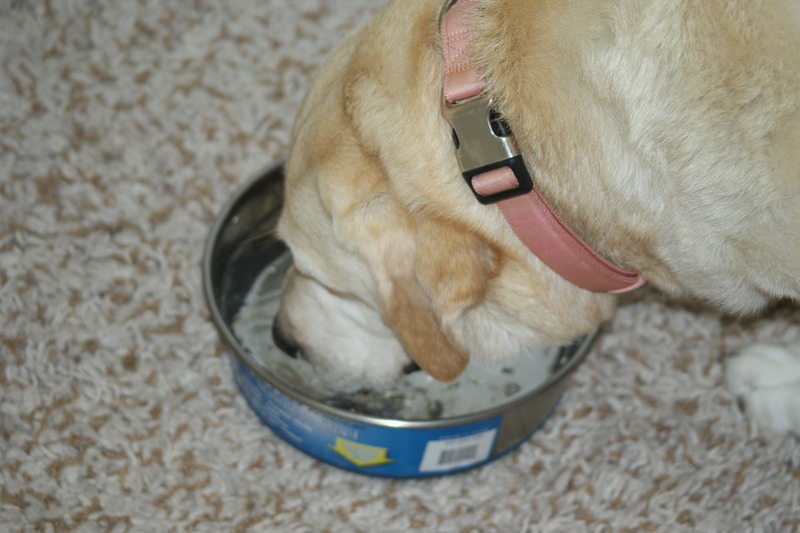 That was fine, until we started to notice that the lab, Queenie, hereinafter referred to as Q, (not to be confused with James Bond’s humorless tech guru) was no longer drinking out of her big water bowl, but drinking instead from the other dog’s smaller one. It required constant refilling. No amount of coaxing could get her back to her own bowl. Absolute, definitive, indisputable scientific evidence. Big bowl full, little bowl empty. To add to the mystery, the pup, Bella, hereinafter referred to as B, (not to be confused with the flying, stinging insect) drank water from either bowl at first, but as she grew, she too rejected the water in the big bowl. It seems that in the animal world at least, size does not matter. But taste buds do. Here’s a scientific fact that you can file away for future reference (or forget about altogether, as you do with all my other posts)….though dogs only have 1700 taste buds as opposed to humans’ 9000, theirs are divided between food and water taste buds. Humans have no water taste buds whatsoever. Of course, everyone knows that dogs have an extremely keen sense of smell, but who knew they could smell and taste water? Back to the mystery. Q really got our curiosity up to the point we decided to investigate. 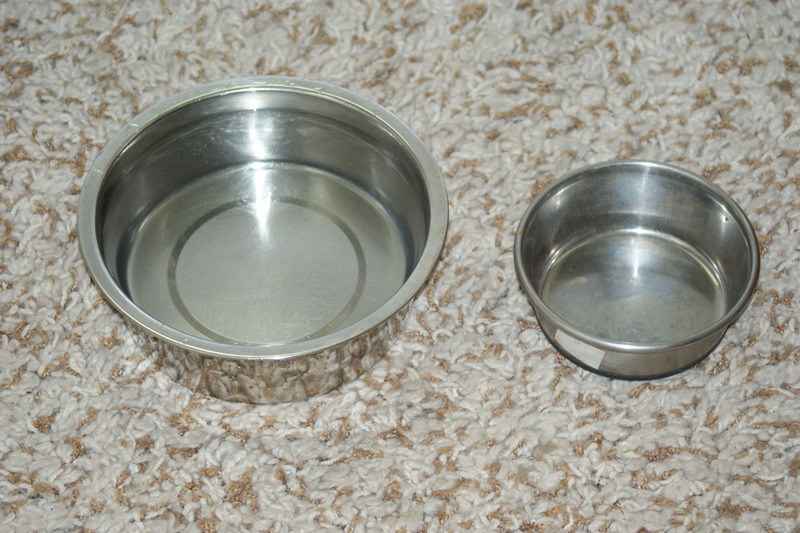 Both of the dogs’ bowl were silver metallic Q’s bowls were older, naturally, but there was a more important difference. They were aluminum, whereas B’s were stainless steel. The light bulb started to glow brightly (the one in my thought bubble, not the one in the room). Of such things is genius born. We went to the pet store, bought a big stainless steel bowl, and the rest, as they say, is l’histoire. (I’m still working on why I’m suddenly speaking French). Turns out that as aluminum suffers wear and tear (from use, washing, etc.) its protective oxide coating can get damaged and it starts to react with water. Q, with her sensitive tongue, was not being finicky, but health conscious. In B’s case, as her “water buds” finally developed, she too became more H2O discriminate. Well, as the saying also goes, a picture is worth a thousand words………I know, too late. 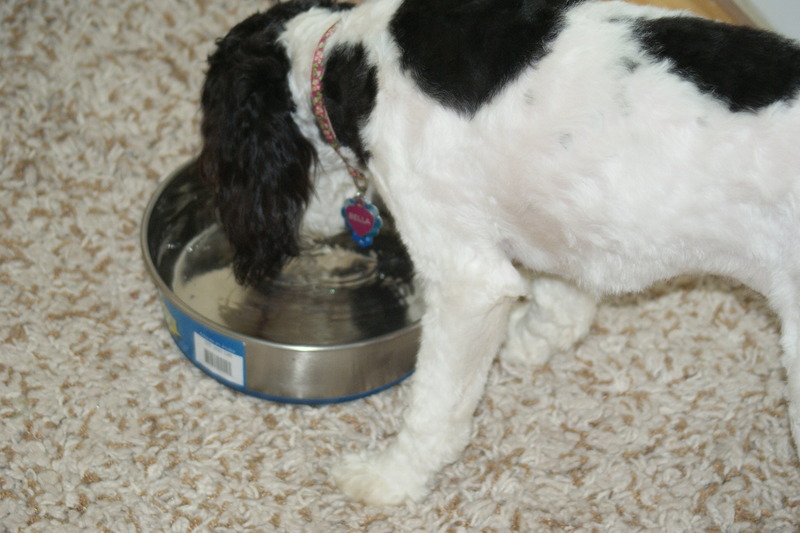 Bella and Queenie enjoying water from their new family sized stainless steel bowl. The moral to the story: always mind your B’s and Q’s. This entry was posted in Family and tagged aluminum, James Bond, taste buds, water. Bookmark the permalink. 28 Responses to If you think I have poor taste…..you’re right….but so do you. I had no idea about this. We have silver bowls but I’m not sure if they are aluminum or stainless steel. I will be check that immediately!! I wouldn’t worry about it unless the bowls are really old. Bella sure has grown up! Absolutely (see my response to Cindy B, below). And don’t even get me started on the other junk they eat during a walk (deer poop for example). It must be in our family, I can (or used to be able to until my sinuses gave up again & now I can taste and smell nothing) both smell and taste water. Water in my house in Dublin tasted markedly different to that in my Nana’s house, or in my friends house up the mountains, or in my Uncles house in Sligo, or my aunties in Belfast, and the water in central London Yeugh!!! Nearly as bad as in my Nana’s house!! Wilson can smell water a mile away, but then when my nose worked I could smell it too, the river smells (not like the Liffey in Dublin – that used to STINK) just a bit musty, and the sea smells strongly, and our pond smells, they are all watery smells. You will remember what it feels like to touch your tongue on the blade of a pencil sharpener (it is one of those things we all have done in our lives) some metals and water don’t mix well! It’s indeed scary to think of what we might be ingesting every time we take a drink of water. Even the so-called “pure” bottled water is suspect. Not to mention that it is contaminated by the plastic from the bottle itself. Do you think we should all emulate the French and drink nothing but wine? I’m game. You? It was the French who invented buying water – remember Perrier… I remember everyone laughing at the idea of paying for water! Can’t think of a better testimonial than that! As if life isn’t confusing enough, right? Glad to help in the smile department, although the dogs would be insulted to hear they are only as smart as me. Where do you learn all this stuff? Water taste buds? I’m glad you figured out what was wrong with the bowl. Smart dogs! Retirement and the internet make strange bedfellows. I’ve seen dogs drink out of the toilet bowl. I guess their taste buds hadn’t developed yet. They’re smart. They know it gets refreshed far more often than their own water bowls. Now eating other dogs’ poops….that’s an entirely different story. I wonder if Queenie would drink the water in Rhode Island, or at least at the first rest top outside of CT. I think the fountain is made out of the same ingredients as her old de-oxided bowl. You probably thought that as a women she was just going through the change. Mais non! The whole thing baffles me. When I take Q on walks in the woods, she will drink out of the yuckiest ponds and streams you can imagine. Must be they have no aluminum in them. OMG! I am a dog. Water tastes different to me in different containers. Even boiled water tastes different to cold water. Honest! You must immediately change your will and leave your tongue to medical research. Who knew? I’ll keep that in mind for future reference. But do you really keep your dog bowls on the carpet? Actually, we have hardwood floors and this is a cheap throw rug especially for the dogs (and me when I’m in the doghouse, which is often) The close-ups make it look like a wall-to-wall carpeting. Even my dogs know more about chemistry than me. How depressing is that? Funny AND informative AND with dogs – my favourite kind of post! So you’re saying that my blog would be better if it was going to the dogs?